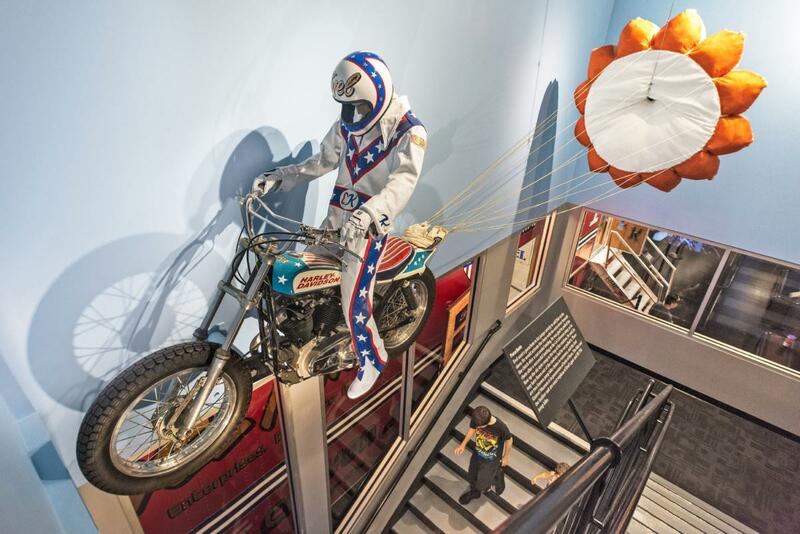 The legend of late motorcycle daredevil Evel Knievel has landed in Topeka, ramping up interest in museums and routes that call you to grab the handlebars and take a ride yourself. Anyone who lived through the ’60s and ’70s understands the pop culture phenomenon that was the man in the star-spangled helmet and jumpsuit. Evel Knievel became an international star with his death-flouting motorcycle jumps over rows of cars or trucks (and occasional sharks and rattlesnakes). Though Evel landed a lot of his jumps, he gained more attention for his spectacular crashes, including an especially brutal landing after clearing the fountains at Caesars Palace in Las Vegas. Guinness World Records listed him for breaking the most bones in a lifetime. At the new Evel Knievel Museum in Topeka’s Historic Harley-Davidson dealership, one display details the many injuries, including X-rays. Indulge your own inner daredevil by donning a helmet, headphones and VR goggles to hear the rumbling bike, feel the rushing wind and rocket up the daunting ramp for a motorcycle jump that Evel never attempted: a heart-stopping leap over 16 cars in downtown Topeka, with the Kansas State Capitol as a backdrop. Other displays include Evel’s “Big Red” Mack truck that he used to trek across the country, the Skycycle rocket he used to attempt a jump over Idaho’s Snake River Canyon, and a mini theater that plays clips from the stunt man’s legendary career. Located in the same Harley-Davidson dealership as the Evel Knievel Museum, this rotating display includes dozens of rare and vintage racing, military and police motorcycles, many of them restored on-site. Cases of other Harley memorabilia round out a self-guided tour. 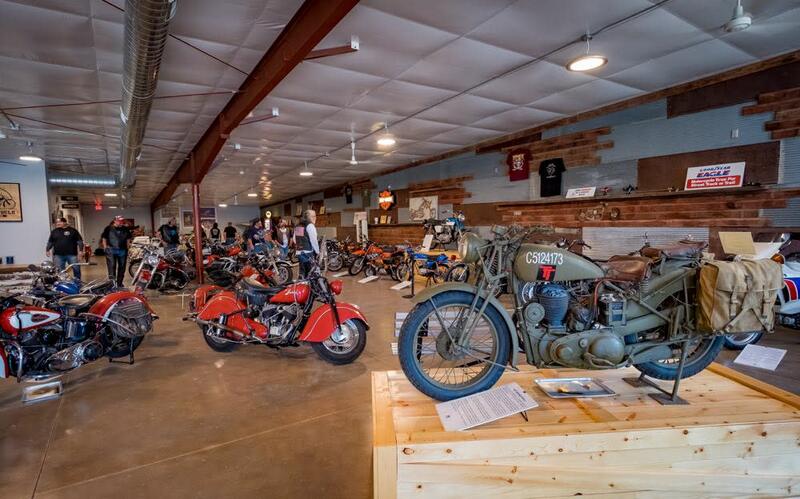 More than 100 beautifully restored motorcycles include a 1957 Harley-Davidson KR ridden by local celebrity “Stan the Man” Engdahl, a five-time national dirt-track racing champion. Check out more than 600 of Stan’s trophies on display at this museum, which is staffed by volunteers. The collection includes vintage signage, 70-plus antique motorcycles and historical artifacts, including an Indian Super Six, one of only two in existence. A perfect stop for riders zooming along the Land and Sky Scenic Byway, this treasure in the state’s northwest corner shows off more than 100 motorcycles, 30 of them built before 1929. The vintage bikes include a 1911 Harley-Davidson, a 1907 Indian and one of only two known 1902 Orients in the world. Zigzagging through the northern Flint Hills, this 75-mile stretch includes miles of natural limestone formations and stone fences unique to this region. The route follows K-99 south from Alma, passing Alma Creamery cheese shop and recreational Lake Wabaunsee. Motorists then whiz by large, rustic barns before the byway turns east onto K-4 and passes through the town of Eskridge, where a historic bank building anchors Main Street. In the center of the Flint Hills, this snaking 47-mile route (K-177) connects Council Grove and Cassoday, passing by the Tallgrass Prairie National Preserve. Cassoday is home to the Cassoday Bike Run, held the first Sunday of every month. 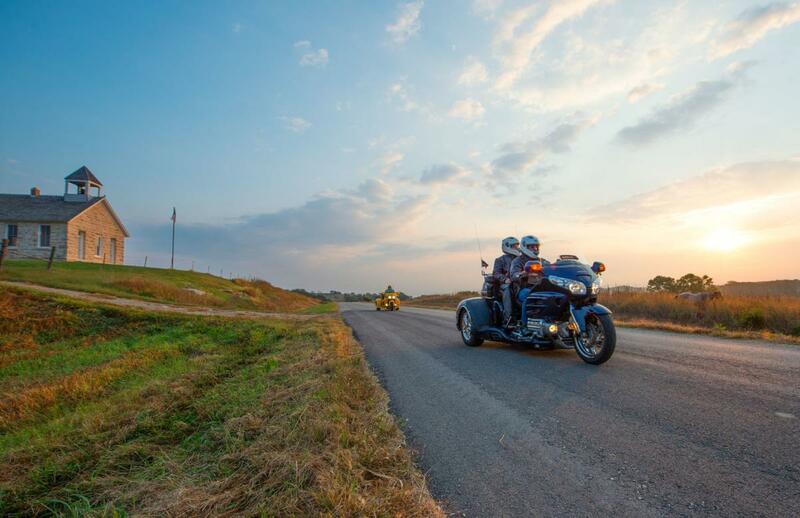 Riders wind through the hills and take in virtually nonstop views of native prairie grasses. 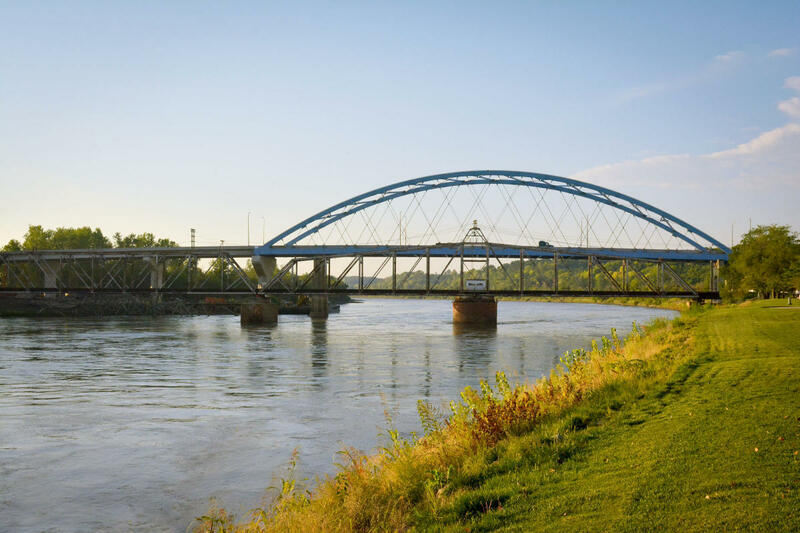 With bluffs on one side of the road and the Missouri River on the other, the 63-mile trek in the northeast earns its name from the hills and rocky valleys carved by receding glaciers. Riders can start in Leavenworth, taking a tour of the oldest Army post in continuous operation west of the Missouri River, before cruising up through Atchison. White Cloud—and its hilltop view of four states—awaits riders at the end of the byway. Riders feel as if they’ve ventured into a different region and time when cruising through canyons and past mesas and red-tinged hills. 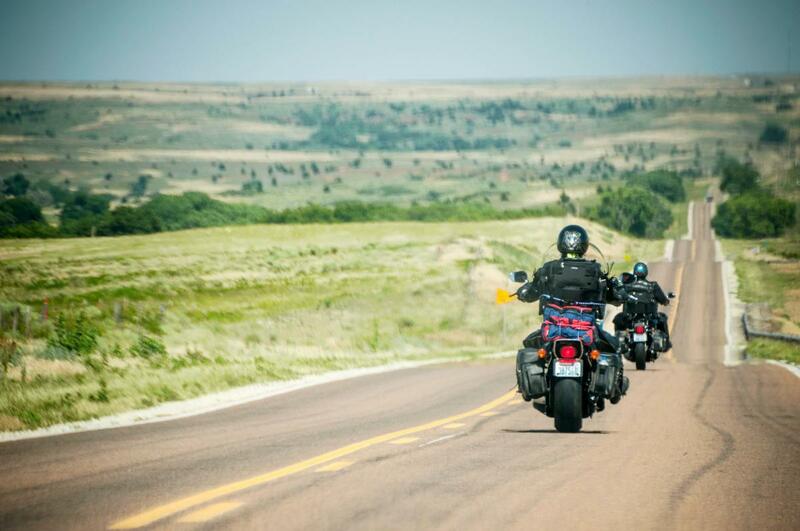 This 42-mile ride along US-160 stretches between Coldwater and Medicine Lodge in south-central Kansas and features two scenic overlooks, plus an optional gravel side road for more adventurous riders. After a day of outdoor exploring, relax at Medicine Lodge’s drive-in theater, shops and restaurants. 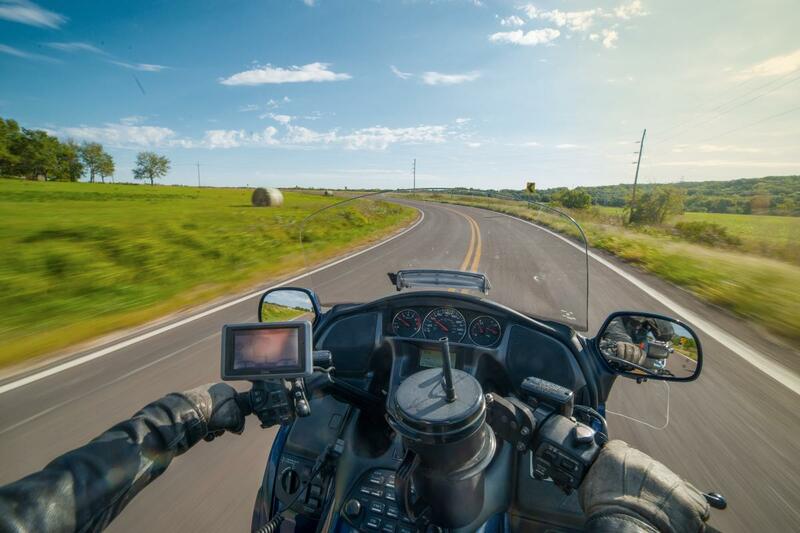 Explore a full list of byway joyrides here, then check out the 2018 Kansas Official Travel Guide for more thrilling road trips.